The goal posts did not move for Tony Lockett from the early days of him kicking the footy with his dad in the street to becoming the game’s most prolific goal kicker. His incredible exploits on the football field will see Lockett become the first footballer in the modern era of the AFL as a national competition to be inducted into the Sport Australia Hall of Fame at the 33rd Induction and Awards Gala Dinner on Thursday 12th October 2017 at Palladium at Crown. Thirty years after winning the Brownlow medal, Lockett will become the first footballer since Alex Jesaulenko in 2010, and just the 24th player across 121 years of Australian Rules Football history, to be awarded one of Australian sports highest honours. Even in his heyday Lockett’s objective was to simply do his best every time he took the field and slot one through the big sticks every quarter. 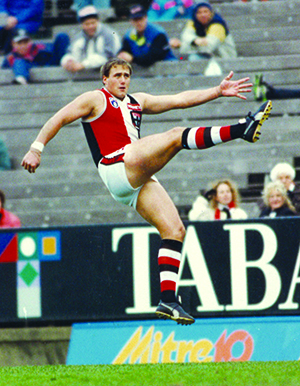 The one they called ‘Plugger’ did that and more over a 281-game career with St Kilda and the Sydney Swans, which saw him retire as an icon of Australian Rules Football with a league record 1360 goals to his name. The statistics alone are jaw dropping with his average of 4.84 goals per game comparable to Don Bradman’s incredible average of 99.94 in Test cricket. It all started for Lockett in 1983 when he made his debut for the Saints at just 17 after making the move to Melbourne from Ballarat to pursue his football dream. “I think the mindset was pretty much to go down there and do the best you can and just do whatever you can to win,” Lockett said. “It was always good to get your hands on one early, but everyone will tell you that, all I would do over my time is just work off one goal a quarter. Just four years after making his debut Lockett became the first full forward to win the Brownlow Medal following the first of six seasons that produced more than 100 goals. “It’s always been a huge thing the Brownlow Medal, not that we play footy for individual honours but I mean it’s a huge individual honour in the game of AFL footy,” he explained. “So to have won one is a great thrill and something I’m very proud of. Career highlights include 118 goals from Lockett in just 16 games to get St Kilda in its first final series in nearly two decades – he kicked nine in the elimination final loss to Geelong in 1991. Since Lockett booted 107 for Sydney in 1998 only current Swans forward Lance Franklin has surpassed the 100-mark in the regular season nine years ago, while at Hawthorn. Franklin has a similar standing in the game as a must-watch player, but few have become players like Lockett, even having a song written about his greatness. As the tune goes there’s only one Tony Lockett and the statistics overwhelmingly point this out with his biggest season tally a whopping 132 goals in 1992 with the Saints in just 22 games. For the first twelve years of his career Lockett called Moorabbin home, and the support ‘Plugger’ received from the goal square at Linton Street was legendary and he thrived on it. “You train and play there, you know, it’s home,” he said. “It’s different today because the MCG is home to quite a few clubs and it just doesn’t have it like it was back in the day. Competitive does not begin to describe Lockett’s nature on the field, he was a fierce player who used his massive frame to dominate opponents. His time at the SCG included a famous point after the siren in the 1996 preliminary final to get the Sydney Swans to its first Grand Final and an ugly drop punt that put him past Coventry and into the record books. Lockett reverted out of the spotlight to spend time with his family in Bowral after retiring in 2002, but has this year surprisingly stepped back into football. “It’s just a low-key role, to just help out a few of the boys with a bit of goal kicking and that sort of thing,” he said of his role at Sydney. Many believe Lockett’s goal-kicking record will remain, yet the man himself thinks Franklin, who sits tenth on the all-time list with 860, may get close. “You know I think Lance is still a good chance of getting there because he’s just freakish really,” Lockett proposed. The players Lockett looked up to as a youngster included Leigh Matthews and Kevin Bartlett – fellow legends and similarly popular figures of the game. Throughout much of his career he carried the weight of the two clubs he played for on his broad shoulders, but ultimately he was just thankful to be on the field. “I was lucky enough to play for about 18 years which is a great thrill,” Lockett reflected. “I represented two great clubs, I played with some fantastic footballers over that time and I feel very honoured and privileged to have played footy for that long. “I just went there and did my best, how it all finished is just the way it is. Lockett was rightfully elevated as an official legend of the Australian Football Hall of Fame in 2015, an acknowledgement he was privileged to receive. Induction in the Sport Australia Hall of Fame alongside the country’s best athletes in their respective sport will be another significant tribute to his career that will be accepted with pride. “It’s just one of those things when you think about it, it’s an incredible honour I’m very proud of it,” he said.